In the Western world, democracy is widely believed to be the best form of government but it’s not, according to the Good Book, anyway. The belief in Democracy is so treasured now, promoted ad infinitum by those with vested interests that it has become an unquestionable religion. In this post I show how the changing political environment in New Zealand has caused challenges for NZ’s top [political] blogger Cameron Slater and while the ins and outs of politics can be fun, even mesmerising, worship of the political system is foolishness – and it will surely pass . . .
Democracy is only a recently revitalised governmental system. Except for a relatively short period in Europe a couple of thousand years ago, democracy has arisen only recently. It has become the dominating style of government now, mainly due to it being aggressively promoted by vested interests – those who create, have and deal with money. It is mainly through Democracy that the Money-Power have secured what they have across the globe; their tools of trade being the intertwining of money creation and political power; the actual enslaving tool being usury (the charging of interest), an immoral and totally banned practice by the main religions including Christianity. The rise of Democracy (along with the associated globalism) give excellent cause to believe that the Beast of Revelation is the Financial/Political [i.e. Democratic] system that we have witnessed arise in the last century or so. Blind, shallow acceptance of this consistently hard-promoted government system, is followed by blind unthinking obedience when it is given the authority to rule. And rule it does! Democracy is essentially mankind determining its own rules for living. If 51% conspire agree, rules are set to the potential objection or disadvantage of 49%. This is not the biblical way. Resulting injustice is justified through worship of the democratic process that created the problem in the first place. Might is right, sort of thing. God’s economy always establishes rules for win-win living scenarios and natural justice. Establishing validity for a less than ideal system because of the validity of the introduced system is illogical circular reasoning. The Christian world-view is that when we do things God’s way, true justice is served. Democracy has no validation in scripture – nothing; no where. It ALWAYS gets a bum rap. Adam and Eve sided with the Serpent and voted against what was God’s ideal. Every prophet mentioned in the Old Testament struggled to get the message out to the ‘voting’ people. The people ‘voted’ to exterminate the only perfect man whoever lived . . . it goes on and on. Cameron Slater is New Zealand’s top blogger. He overtook David Farrar’s blog KiwiBlog a while back in terms of numbers of page-views. Both bloggers are political commentators, and self-classify as Right-wing. Cam was raised within ultra-active political circles. His father was a leader in the National Party and he has built his blog Whale Oil over the years into a strong resource, capable of serious political influence. He is widely disliked within the MSM circles resulting from his early abrasiveness but now has a relatively narrow but actually quite a strong support-base. I have always appreciated his political commentary which is refreshing to say the least. Add in accurate, informed and astute if you want to shower him with compliments. Direct, confrontational and fearless if you want to get a little deeper. While his focus has changed over the years from a personal venting website to a website with strong political commentary to a website with values and an online community, his support of National Party values and generally the National Party itself has been pretty much unwavering. Whether he likes it or not, Cameron Slater is widely perceived as a National Party man. Two things in recent times though have affected his relationship to NZ politics – the first is that he had a stoush with the Prime Minister of New Zealand at the time, John Key. The second is that Bill English inherited leadership of the National Party when John Key stepped down. The first above-mentioned event terminated a working relationship between a top blogger and the top man in the NZ political scene (certainly for all intents and purposes). Knowledge of txts between the two became public; there was a bit of tut-tutting; political pressure arose and a few unwise things were said and done. Tensions arose between the two sufficiently that Cameron’s wings were clipped against his best intentions. He got an apology from the PM as a result, but as he admits himself, this was certainly done so that any court action against the PM was averted. Whatever the details, losing a direct communication channel to the top of the political scene it is NOT the sort thing a political blogger would want – and especially not when done in the public eye! An apology and a win on principal in exchange for loss of communications to the top dog in politics is really a net loss. Increased negativity towards John Key naturally resulted, and this is only natural. The second above-mentioned change in the political scene has surely been a devastating blow to Cam, best understood by digesting his own words that he “can no longer support the National Party [with Bill English at the head]”. Shocking for most and terminal for some relationships. 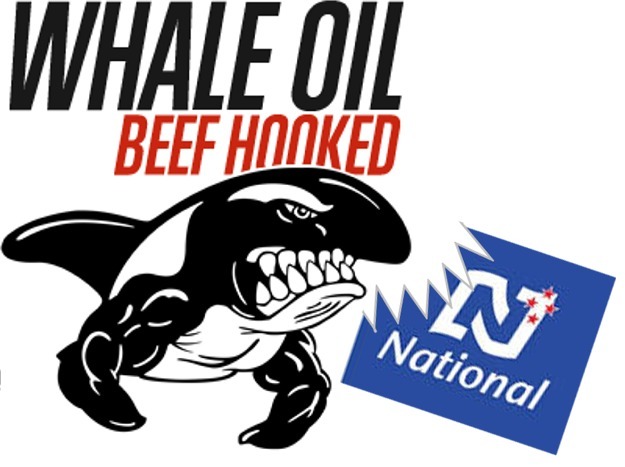 The spin is that Whale Oil has never been a National Party “supporter”, just a blog ready to take on anyone, anytime including the National Party when they deserved it. While this is technically true, it misses the point that Whale Oil and Cameron Slater are widely perceived to be National Party supporters – ‘against the Left’. A downturn in National Party support, must give Whale Oil’s detractors a huge boost. As National goes down in the Democratic cycles (there is only one way when you are at the top!) so too must Cameron and Whale Oil. Cam’s take is that the new Prime Minister, Bill English – is a nasty piece of work – that there is a snarky side that came after his family at some point in the past. A politician uses his power for personal gain! This is the nature of political power, to present one picture to the world yet the reality hidden behind the power. Talk about the Garden of Eden! Cam and his team are survivors and will adjust their offering to the new realities but the reality of Democracy is that while politics can be fun, it is brutal, deadly, immoral and inherently evil. There simply isn’t any politics in the Kingdom of God. All of us who watch, participate, fight for and enjoy politics (especially that of Democracy) must accept that it is eventually all for naught. Power and money can and will play games as long as they can. The implosion of the global financial system will occur simultaneously with the removal of the political systems whereby the elite of mankind has leveraged the worship given to it for self. Harking back to the Garden of Eden, where man walked freely without shame with his Creator we can see the essence of His design – a flat management system. Extrapolating this out into early societies required increased rules as relationship deteriorated and thus opportunity for the Power Money to benefit. In the current age, where rules are not only written and enforced in increasing measure we have moved away from God’s original rules. We can only expect that freedom from undue influence of the elite when the system implodes. There’s a way to go yet! Preparing for a future without politics is best undertaken by recognising the current ways are abhorrent to a God who cares enough to explain how things really work. He did this in sending Christ, of course. Thought leaders in His economy are not those with Political power or Money that lacks backing, but are those who believe in a world where money is ‘clean’ without interest . . . where people have what is genuine power to influence gained from their integrity and wisdom; from their productivity and capacity to help others; from their willingness to love and give. It doesn’t matter how many men died in war ‘for the cause’ in times past; it doesn’t matter what we see on TV screens, the papers or the Internet; it doesn’t matter who is who in the Power/Money circles of ‘thirteen bloodlines’; it doesn’t matter how many countries adopt Democracy as a form of political power . . . if we believe in and worship something that is accursed, we’ve brought a curse upon ourselves whether we like it or not. There are alternatives, better ones, but it requires us to think humbly and to dare to ask questions. Cameron Slater can squalk as much as he likes about whatever tickles the fancy of his readers, and I can cough, splutter, agree and laugh along as it tickles my fancy, but at the end of the day he’s a smart cookie. He will surely come to realise that he’s a commentator of a temporary passing structure in one particular age. Sadly most will not, until they have no choice in the matter. It’s wiser to put our trust in the Creator and His ways rather than “the best of all other worst alternatives”, as Churchill is often quoted as saying.